Time for another challenge at SOUS, this time with a sketch from pagemaps. There are some changes on our team from this week. This is the last sketch you will see Debbie and Lisa do for our team. We are sad to see them go, but we are also happy that there are four other designers joining us from today. On the SOUS-blog you can see a presentation of them all, or you can follow the links to their blogs here: Ness, Bonnie, Dawn and Wanda. For my layout this time I have again chosen some quite old pictures of my daughter (january 2008). 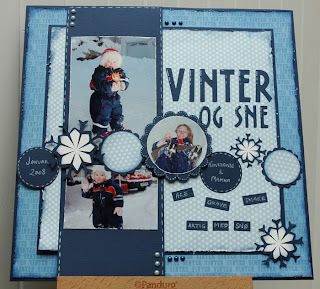 The background paper has the word winter (or vinter in norwegian) written all over and is by Papirdesign - my local paper and stamp designer. Hope to see you at SOUS! Cute layout, Stine!!! The snowflakes are soooo pretty!! Sweet photos and it looks like she's having a lot of fun!!! Hugs!! Love your take on the sketch! Love the wintery feel to this one and of course, those cute pix of your dd. Have a super week! This is so cool and I love the dark blue for the page! The photos are great! Hope you all had a wonderful weekend! We had a nice time with my in-laws here, still here actually but leaving today. Hugs those babies for me!!!! sweet take on the sketch! looking forward to working with you and getting to know you! Love your take of the sketch. The colors are very pretty.